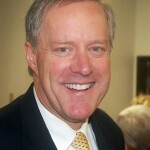 Meet Mark Meadows, the recent Republican survivor of the second primary for the 11th District Congressional seat, currently occupied by Rep. Heath Shuler (who isn't running for reelection). Within seconds of his win yesterday, the National Republican Congressional Committee sent out a press release declaring Mr. Meadows a totally awesome hunk of grade A Conservative Meat. In other words, a "Young Gun." It's almost as though they already had that press release written. Eric Cantor and Paul Ryan, blessing their preferred bunk mates in the next Congress? Mr. Meadows did, after all, say in advance that he would support the Paul Ryan budget to slash the living hell out of Social Security, Medicare, and Medicaid, so why wouldn't Paul Ryan name him his favorite "Young Gun"? But then, also as of today, when Mr. Meadows found out apparently that the Ryan budget would slash the living hell out of Social Security, Medicare, and Medicaid, said he would not be in favor of that, no never, so consider us confused about this particular "Young Gun." Can he in fact shoot straight? Or is he slightly bent? We are relieved to see, however, that Mr. Meadows is a confirmed birther and is highly suspicious of the United Nations taking over city planning and the perfidious fluoridation of our precious bodily fluids (probably). It's truly a relief that the Republicans in the 11th Congressional District know the difference between sane and crazy, and ALWAYS go for the crazy. Or the mealy-mouthed.